The price of oil is currently very low (31-32 USD/barrel). The main reason for this low oil price is slower economic growth in China, at the same time as oil production in the United States has increased enormously from what it used to be few years ago. Which means that oil consumption (demand) is growing slower than what was expected, and at the same time we have strong oil supply. Now when the price of crude oil is very low, it is worth considering what it costs to produce the oil. Today, the world uses a total of 95-96 million barrels of crude oil and liquids every day. The current daily supply is probably 1-2 million barrels more. According to he International Energy Agency (IEA), the gap between demand and supply will soon decrease and then the price of oil is likely to rise. It is impossibly to say when or how fast this will happen. However, when looking in the back-mirror we see that oil consumption tends to grow year by year, at least if the world economy is growing. And even if oil consumption would stay flat for some years, most producing fields can only sustain the daily production within a fairly short time-frame. Thus, new oil fields need constantly to be located and put into production. 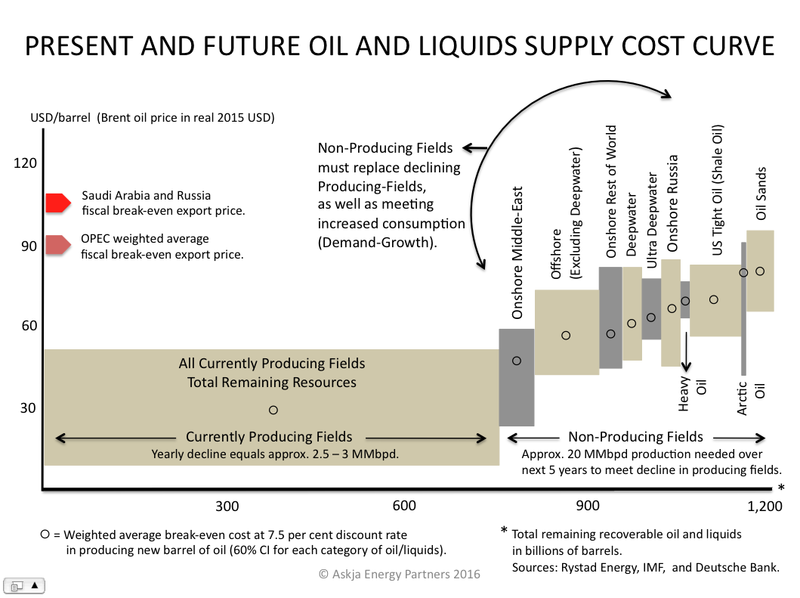 When discussing the price of oil production, we not only need to look at what will be the cost of new production within the next months and years, but also what the cost will be when looking a bit further ahead, like a decade. 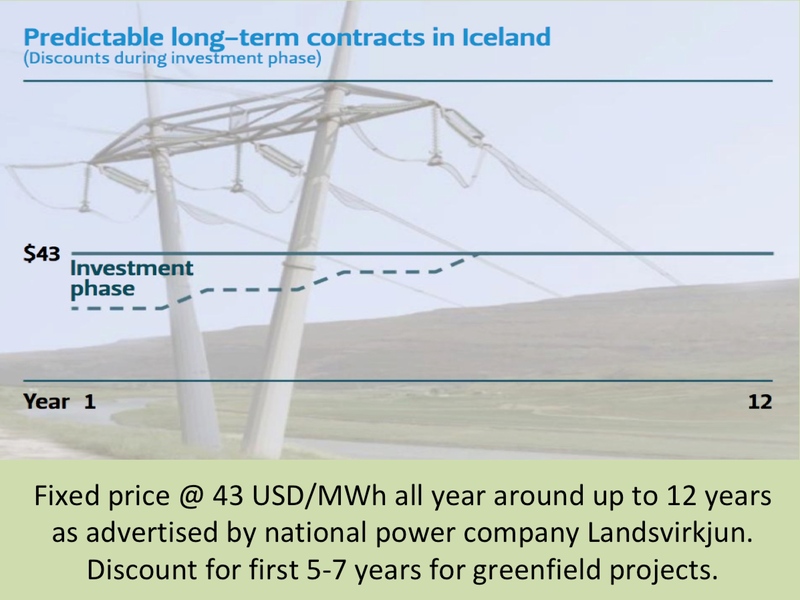 We could also have a look at todays production costs from producing fields (operating cost or lifting cost). Today we will, however, keep the focus on the future production costs. Average cost of current oil production is close to 30 USD/barrel (this is an estimated figure put forward by the Norwegian consultancy firm Rystad Energy). 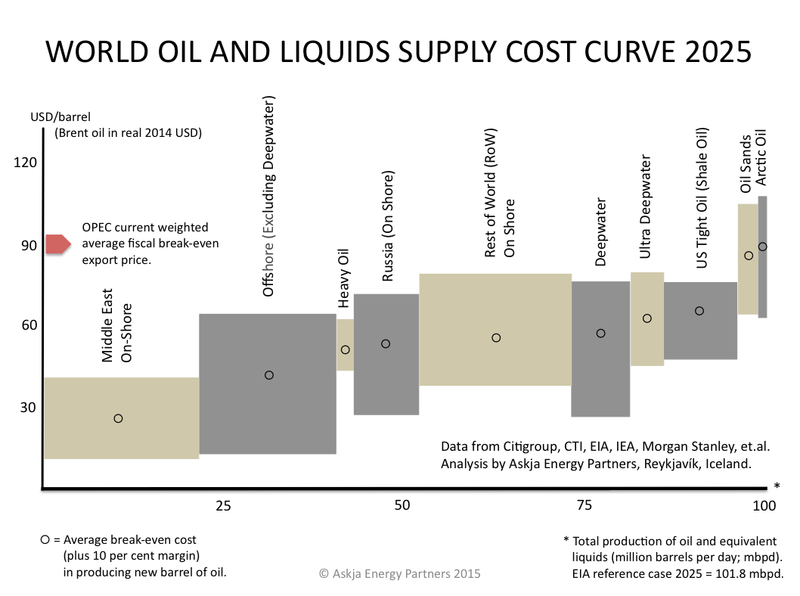 The cost varies, but most of today’s oil production costs is between 10-45 USD/barrel. Some of the most recent projects are very costly and need higher oil price to break even, and some of the producing fields in the states around the Persian Gulf deliver oil at less cost (under 10 USD/barrel). But the average cost from all producing oil fields in the world is believed to be close to 30 USD/barrel. Producing fields are not able to deliver us all the oil we need for a very long time. Many large fields are in decline and therefore we constantly need new producing fields to meet all the consumption. The US Energy Information Agency (EIA) predicts that after a decade or so daily consumption of crude oil will probably have reached 99-105 million barrels. To ensure all this oil will be brought up from the ground, oil prices will soon need to be approaching 60 USD/barrel (in present value) and then head towards approximately 80-90 USD/barrel. If the oil price will continue to be substantially lower than 80-90 USD/barrel, many new projects will be delayed. Eventually that would lead to supply crisis. In reality it will be hard to balance the supply and consumption (demand) perfectly. Therefore the oil price will most likely fluctuate substantially. But if the oil price will soon head to 80 -90 USD/barrel we can hope for relatively stable oil price for some time (maybe over a period of few years). So, if the oil price will soon approach 80-90 USD/barrel, the world may avoid supply crisis – in the near future at least. The diagram at left shows where the additional oil will come from in the next few years. And what oil price will be needed to bring that oil up from the ground. In addition we must remember that many oil-producing states need high oil price to be able to balance their state budget. This factor may and will influence oil production. With regard to this issue, Saudi Arabia is the country to watch. Because Saudi Arabia it is the only oil-producing nation that has substantial spare capacity – thus being able to increase their oil production quite fast if the want to. If Saudi Arabia will abandon their current market-share-oriented-policy and decrease production, the price of oil may rise quite fast. But if the Saudis keep on trying to squeeze high cost producers off the market, by keep pumping up their low-cost oil at present pace (and even increase their production), oil price will stay low. For some time at least . And low oil price will increase risk of future supply crisis. When we look a few years further into the future – let’s say ten years or so – we can expect the price of oil to approach at least 90 USD/barrel. To keep production up with consumption (demand) we need to access numerous new oil fields that now are in the early stages of development. We will see new low-cost fields in the Middle-East come online, and at the same time new oil will be coming from all kinds of oilfields all around the world. And we will most likely be needing all this oil and also expensive oil from Canadian oil sands and even oil from the Arctic. The graph at left shows where the oil will probably come from in 2025. Large share of this oil will be coming to the market even if the oil price will only be in the range of 60-80 USD/barrel. 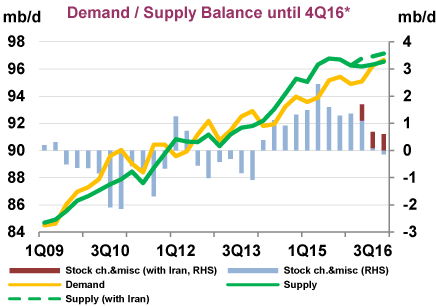 But if we are hoping to avoid major supply crisis, the oil price needs to become substantially higher. Like close to 90 USD. The conclusion is, that within the next decade we will most likely see the price of oil (in present USD value) approach 90 USD/barrel. Of course the price may in some periods become higher and sometimes it will be lower. No one knows what the price of the black gold will be at a certain point of time in the future. But if the world economy is going to keep on growing, like we are used to, we will need crude oil. A decade from now it is unlikely we will have that oil unless we are willing and able to cover a production cost of approximately 90 USD/barrel.